Added by bascule (Tony Arcieri) over 2 years ago. Updated over 2 years ago. If there's interest in supporting BLAKE2 in the Ruby standard library, I can put together a patch. Is BLAKE2b unavailable if 64-bit integer is unavailable? I meant that BLAKE2b seems to need uint64_t. If a compiler does not support such large integer type, isn't BLAKE2b usable on that platform? Is there still a supported environment without 64-bit integer support? ext/digest/sha2/sha2.c is already using 64-bit integers. It is compiled only when OpenSSL (or CommonCrypto) is not available, but the current versions of OpenSSL also require uint64_t. But, I'm wondering, why not add the SHA-3 winner but only BLAKE2? Nice @ SHA-3 branch. I think it makes sense to add both. 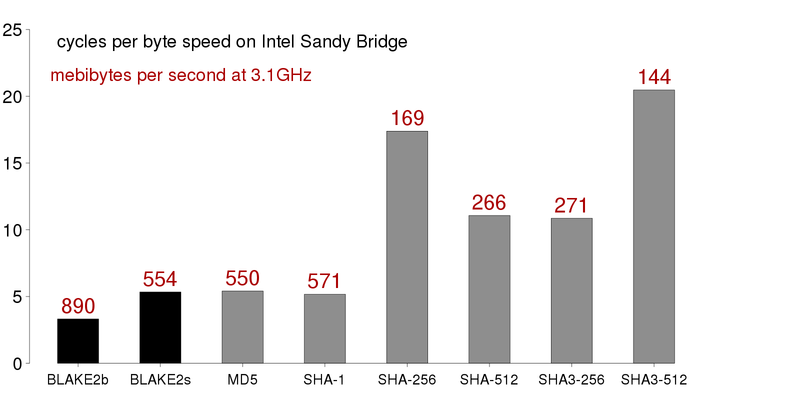 BLAKE2b on a modern Intel CPU is even faster than MD5, but provides substantially better security. Something of a grassroots movement is pushing for the use of BLAKE2 anywhere speed is important, such as checksumming large files. Many part of CRuby requires int64_t/uint64_t. We looked at this issue at today's developer meeting. We could not be sure if we need our own implementation of BLAKE2 (or SHA3). Maybe a matter of time? We might need to use SHA3 someday, but OpenSSL should also have one at that time (BLAKE2 is there already). Isn't it better for us to encourage people switching from Digest to OpenSSL?